Apparently, it started here, then spread like wildfire through the security mailing lists and twitterverse. 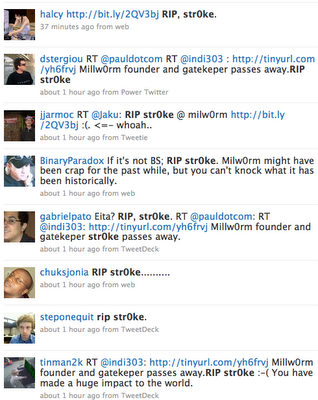 str0ke, of Milw0rm, was no longer among the living. I had my doubts. One entry on a blogspot blog doesn't usually constitute breaking news, and there was no more authoritative source. Some people who saw my skepticism told me that it'd be pretty screwed up to fake a death of someone like str0ke. All I can say? Madoff. Lori Drew. Fake Facebook deaths. Bonnie Sweeten. There are some f'd up people in the world, and a lot of them do f'd up things over the Internet. Str0ke is still alive and well. Or is he?